Okay, this is the book that goes with the YNAB budgeting website. Kristin recommended the site to me at some point in the last year or so, strongly recommended, and I have since recommended it to other people who have had some level of monetary stress (where "some level" is greater than zero). This book came out in December of last year, though I hadn't picked it up from the library until last week. 1. Starting with the money you have right now (not the paycheck coming up, not the invoice you sent, what you have right now), Give Every Dollar A Job. 4. See how long you can hold on to your money, make it a game, and Age Your Money. The shift in thinking is goooooooooood. Doing the exercises, setting all of this up, is haaaaaarrrrrrrrrrrrrrd. . I believe the process is worth it. 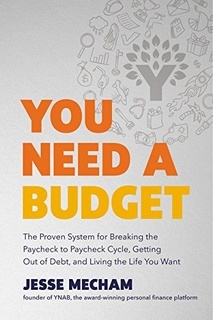 I liked the chapters on budgeting as a couple and teaching kids how to budget, which is more than a bit ironic. This book is everything that I expected to be, which is awesome. I believe adopting the strategies in the book will change your life. If you can't check the book out from the library (my library had a 14 week waiting list), let me buy you a copy. You haven’t failed at budgeting, you’ve adapted with the best of them. That cruise is a pipe dream if you don’t know where you stand with the basics that make you a functioning member of society. Write down all of the places your money needs to go. Focus on payments you’re obligated to make to keep your life running. Think food and shelter, loans, school payments, and any necessary work expenses(for example, an Internet connection if you work from home, commuting costs, etc.). To start, make sure you’re separating honest-to-goodness obligations from habits disguised as necessities. It can be hard to distinguish between the two at times. So try this: Imagine your future self having done each thing on your list. Which feels better? Seeing the kids and their friends enjoying the yard? Bike riding through Amsterdam as a family? The sense of security knowing you’re helping with college? Or imagine your future self explaining to a good friend why you chose one over the other. Does it feel right? Maybe you spend more than the “recommended percentage” on rent, but you also don’t own a car and you bike to work. Boom: car insurance, car payments, fuel, and gym memberships have no place in your budget. This is just one way that cookie-cutter advice rarely works. Lifestyle creep is when the cost of your lifestyle rises in tandem with your income. Once a year (I like to do this in January), question every one of your expenses. Question the “givens” like housing, transportation, and insurance. Question the vacations you always take, the gifts you always buy, and the food you always eat. Every single item should be on the table. Rule One hierarchy: Take care of your immediate obligations first — a roof over your head, food, for you and your family, and bills like electric and heat that mean bad things if you don’t pay them. Then move to the true expenses. These are large, irregular expenses that surprise you(you know the feeling) but really shouldn’t. What are your highest priorities after your obligations? You may not like the truth, but you’ll be better off. Budgeting forces you to make decisions you’d otherwise avoid when you think you’re steeped in cash. You need this clarity on a variable income, or else the agony of your low-income months will be so much worse than the joy that comes with big payments. Predictable expenses aren’t frequent but we know exactly when they’ll hit and how much they’ll cost. Whether you’re dodging blows or coming up with your game plan, you’re always strategizing, adapting, and working to accomplish a big goal. You wouldn’t think of just standing there. And like any challenging activity, you’ll do your best only if you take care of yourself in the process. That means being kind to yourself when you need it, sticking to your values, and staying focused on the big picture. If a budget sounds worse to you than talking about money on its own, hang with me. It really does help. On a very basic level, it’s much easier to talk about your money when it’s through the lens of a budget. Now it’s not about your debt or my debt, my spending or your spending. It’s about how it all works within the budget. The budget is like a neutral third party that keeps the conversation grounded in reality. If you’re struggling to convince your partner that budgeting is important, be sure you’re very clear on what you mean by “budgeting.” Nobody will be micromanaged or put on a leash. The point is to actually feel free and empowered. Budgeting together will mean you’re working together to achieve your shared goals — not your goals for your partner. You’re asking him to budget with you because you want him to have a voice in what happens with your money. Not the other way around. Your idea of peace may involve freedom to order takeout most nights so you don’t have to worry about cooking. Your partner may look forward to cooking each evening as a way to unwind. You can use your first budget date to explore Rule Zero in three ways: what’s most important to you as an individual, what’s important to your partner, and what you value together as a couple. These will evolve into your budget priorities, because when you’re budgeting as a couple, your budget will have three sets of priorities: yours, mine, and ours. The only way to reveal all those priorities is to talk. Think big. Be open. Share your hopes and concerns. These conversations do end up looking a lot like first date material, only now you don’t have to worry as much about scaring the other person away. Assumptions will get in the way if you aren’t clear with each other about what’s important to you as an individual, and which goals you share as a couple. It’s too easy to assume that your priorities are the same as mine. Or that our priorities are always more important than mine. These quiet assumptions are what make budgeting as a couple stressful when it absolutely doesn’t have to be. You need these sessions to be a safe space where you can talk openly, listen to your partner, and compromise. Before each of them started on their debt paydown journey, reaching the end seemed impossible. But they set their goals and put in the work every day, consistently, for a long time. The hardest part of teaching my kids to budget was teaching myself to let go. Once the money is theirs I fiercely believe we should not try to manage or control it for them. Usually a restart just involves putting away your old budget and starting a new one. Simply looking at all of your money as a clean slate, nothing attached to any jobs, is a powerful exercise.